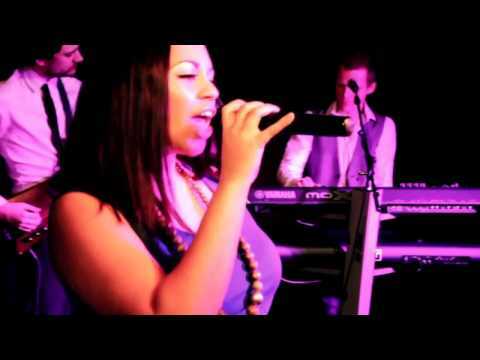 Soulshine is an exceptionally talented function band playing pop, soul, funk and disco hits from the 60’s to the present day to give any event that special something. Highly experienced at weddings and corporate events, performances include The Savoy, The Ritz, The Hilton, Blenheim Palace, Emirates Stadium, and The London Science Museum. With a wide repertoire which is regularly updated, you can expect to hear your favourite pop, soul, funk and disco hits from the 60’s right up to the present day. Artists include Aretha Franklin, James Brown, Stevie Wonder, Chic, Michael Jackson, Jamiroquai, Amy Winehouse, Adele, Beyonce, Maroon 5, Bruno Mars, and many many more…! Fronted by highly charismatic vocalist Sasha Patterson, and supported by a super tight rhythm section with optional horns, Soulshine is a slick, professional function band that really knows how to work the crowd! Sasha is an extremely talented front person with a soulful, powerful voice and bags of energy who loves to interact with the crowd. Tom and Jon drive the rhythm section on drums and bass, and both combined are about as funky as you can get. Rick is a highly accomplished guitarist, providing rhythm and lead with his super slick licks and impressive solos. James takes care of the rest on keyboards and backing vocals, layering pianos, strings, brass and synths which gives the impression of a much larger band. Whether you envisage a spell binding performance during your ‘First Dance’, a classy accompaniment to your evening dinner, or a fun filled night and a packed dance floor, Soulshine can deliver on every level. The most popular and affordable option is the 5 piece band which consists of vocals, guitar, bass, drums and keyboard/ backing vocals. If you really want to impress, we highly recommend the 7 piece option which also includes live trumpet and saxophone. There's nothing quite like the sound of a live horn section, and having the saxophone and and trumpet will add more sonic impact and spectacle on stage. You can also choose extra performances as a duo or trio in addition to the full band if required. This is a very popular option during the wedding ceremony, drinks reception, or dinner before the party really begins! Here is the piano vocal duo, also available separately. Whatever your occasion, you are guaranteed an utterly professional, and spectacular performance that you and your guests will never forget. DJ music or background music can be provided between sets, and ipod connection is available if you wish to make your own playlist. Sorry, Soulshine doesn't have any photos right now Send us an enquiry and we'll get back to you, or check out the rest of the act profile. Sorry, we don't have a setlist for Soulshine yet Send us an enquiry and we'll get back to you, or check out the rest of the act profile. ?Hi, I just wanted to say quite how phenomenal you guys were last night - thank you SO much!